It is a long way to travel to lose 0-1. Hard luck ladies! Seb writes "Warwick hit Stone for 6 to maintain their winning run. After going a goal down, Bryce, Mart and Ollie twice put us 4-1 up half time. Finish 6-3 with another Mart goal and Phil rounding it off!" Angela reports: "Warwick 2' s narrowly lost 1 - 0 to a very physical Sutton side. Injuries to Mel and Widge resulted in Warwick seeing out the game with only 10 players. Get well soon Mel!" 1-1 draw - good result. JK reports: "Your correspondent will deny ever ever having admitted that he would have taken a draw at the beginning of the match, but if we are truly fair this was a decent result for the home side given the overall balance of the game, and not quite the “snatched from the jaws of victory” mood that was present on the pitch immediately after the whistle blew. Man of the Match was MacDonald for his superb display dropping back from centre forward to be our stand in goalie." Check out the Second team page for their new season team photo and match day photo-gallery. Oh, and JK's drag flick corner, see below! Langers reluctantly reports a 5-2 loss "Early defensive errors and poor passing set us back to 3 down after 10 mins. Re-organising to 4-3-3 for the second half made a positive improvement and at times we controlled spells of the game and a little more fortune in front of goal might have led to a different result. The game finished 5-2. POTM was Ian Best and nice to have two young debut appearances from Freddie and Archie"
Sharon writes: "Despite losing 4-0 to a very strong experienced Olton opposition, Warwick ladies 4's defended tirelessly in the second half but unfortunately failed to get through the opposition's midfield. Still a great team performance for a newly established team." 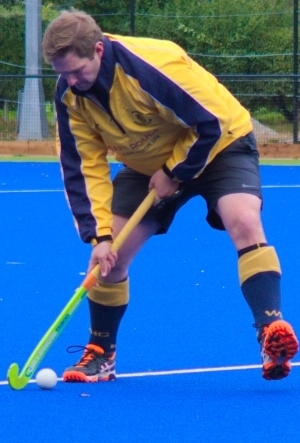 Nick writes: "Warwick 4s got their league season off to the best start with a scrappy 3-1 win at home to Barford Tigers' 4s"
Claudio reports: "Warwick 5ths cruised to victory at Leicester Westleigh ..4 goals in the first 25 mins saw the opposition off. Good team performance to avenge last season's defeat on a heavily sanded astro"
Well done Badgers especially as they had to play with only 9 on the pitch for a spell!